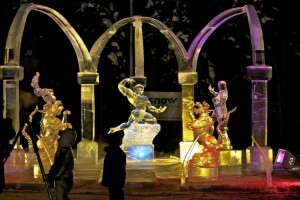 Each year the Golden Heart City of Fairbanks hosts one of the world’s largest ice-sculpting competitions and exhibitions. The BP Ice Art Championships assemble the most talented ice artists from more than 70 countries worldwide and attracts an estimated 45,000 visitors each year. This month-long event kicks off Feb. 26, and runs thru March 31. The championships includes four division categories, from novice to professional, as well as a youth competition and a children’s ice park. We invite you to visit us at the Fairbanks Princess Riverside Lodge to explore the city and enjoy this annual spring event. Hosted by Ice Alaska every year in Fairbanks, the Ice Art Championships began in 1988 with residents from Fairbanks and the surrounding areas who wanted to celebrate the return of spring to Alaska’s interior. This event went from a small weeklong celebration to the month-long competition it is now. Over the years, the competition gained popularity, attracting artists from all corners of the globe, who make the trek north to Fairbanks to carve and compete with their creations. This year, the Ice Art Championships celebrates its 24th anniversary and will host the event in its new location, the George Horner Ice Art Park. 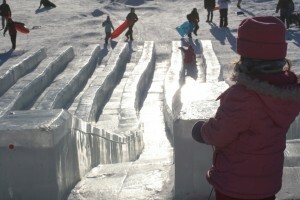 The competition and exhibition relocated to the 27-acre, centrally located park due to its bigger exhibition space as well as its larger and deeper on-site pond that produces more than 400 million pounds of “Arctic diamond” ice – clear, thick blocks of ice the sculptors use for the competition. Neighboring the ice park is a kids’ park, fully constructed from ice and featuring dazzling ice slides, glistening ice mazes, a skate rink and an ice stage for live performances with a concession area. The entire four-acre children’s park was constructed as a result of the ice sculpture exhibition, and is a lively place for kids and families to gather and enjoy the competition. The BP World Ice Art Championships’ division categories include the Single Block Classic, the Multi-Block Classic, the Amateur Open Exhibition and the Youth Classic. The Single and Multi-Block Classics attract the professional ice sculptor teams that create massive, spectacular pieces of ice art. The Single Block competition is held Feb. 26 -28, and winners are announced on Friday, March 1. The Multi-Block competition runs from March 3 to March 8, with an award ceremony that takes place on Saturday, March 9. The Amateur Open Exhibition opens Feb. 27, and the Youth Classic begins March 12, with both exhibition divisions concluding March 15, and recognition ceremonies held March 16. For more information on reservations at the Fairbanks Princess Riverside Lodge visit www.princesslodges.com/fairbanks-lodge.cfm. 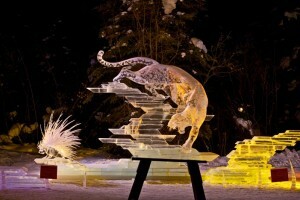 To learn more about the BP World Ice Art Championships, the 2013 schedule and participating sculptors, visit http://www.icealaska.com/.